"This Fundraiser will include cow patty bingo, rag ball tournament, silent auction, car show, concessions, jump house, live music, face painting and the 1st annual craft show event with a variety of vendors!" 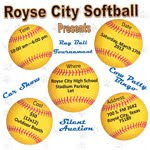 High school is located just south of I-30 and FM 2642 in Royse City. Booths are outdoors, 12 X 12, and cost $50. No electricity available. Applications are available here and are due by March 3rd, 2012. For more information, visit their website or contact their event coordinator, Chris Wilkins, at chris.wilkins1414@yahoo.com.